I have 93 final portfolios and 24 research papers to evaluate, comment upon, and assign grades to. Then, using a complicated formula I do not really understand, I have to calculate final semester course grades for each student, and post those grades so that they--in turn--can log onto their computers and see whether or not I have ruined their lives. Or at least I will have, any minute now. "Yeah, yeah, yeah. Keep your shirts on. I'll grade 'em--when I get good and ready." These grades, though, have to be posted in less than a week. I don't know what happens if they aren't posted by the deadline. No one I know or heard tell of has ever missed it. I hadn't realized I was so uptight about this, until I thrashed about in fitful sleep all night--grading papers in my dreams. I'm all tired and grumpy today because essays I haven't even seen yet were gently rapping, rapping at my chamber door. It's like having someone say, "I'm going to poke you with this lit cigarette a couple times. In just a minute." 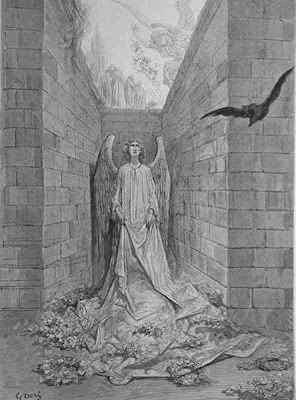 Image, #5 of Edgar Allan Poe's The Raven by Gustave Doré (1832-1883). Oh, quit complaining, you know you've got it good now. You've been to the other side an know what real deadlines can do to a person. I think it's funny to hear you fret about getting grades done on time. I seem to remember us in the office wondering which one of the faculty would be late this semester.